Wendy Lamb Books, 9780385737449, 224pp. Camp Wickitawa, here we come! 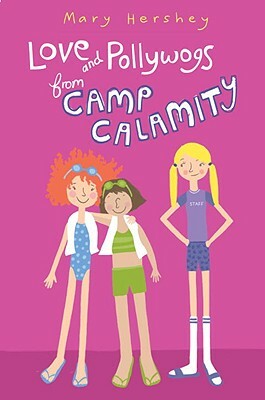 Mary Hershey's third book about fourth grader Effie Maloney is a hilarious Texas adventure, complete with a camp ghost, swim lessons, rescued armadillos, campfires, and cowgirl stew. Mary Hershey has a number of "fond "memories from Camp Talaki, which now rests at the bottom of a big lake not too far from her home. She swears she had nothing to do with that! What she loved best about camp was her afternoon snack, reading, getting benched from swim class, and mail call, because she never gave up hope that her mom would send her a one-way bus ticket home. (She did send marshmallows, and an encouraging note.) Mary Hershey loves writing about the stuff she was forced to endure enjoyed when she was in middle school. She is the author of two other books about Effie Maloney: "My Big Sister Is So Bossy She Says You Can't Read This Book" and "10 Lucky Things That Have Happened to Me Since I Nearly Got Hit By Lightning." She lives in Santa Barbara, and still loves a good afternoon snack. To learn more about Mary Hershey, visit her on the Web at www.maryhershey.com.